When James Bond swaggered into our lives for the 22nd time in Quantum of Solace he was pitched against an eco–warrior gone bad – a man hellbent on controlling Bolivia’s water supply at any cost. Audiences, it seems, have become too clued up to believe in the Bond villains of yore, those cat–stroking loons who, instead of just going to a desert to launch a nuclear warhead, felt compelled to begin Armageddon from inside a hollowed out volcano. But for all the people wrapped up in Daniel Craig’s CGI-enhanced shorts, there are millions who would secretly prefer a return to the halcyon days of ejector seats, jet packs, suitcase helicopters and underwater sports cars. 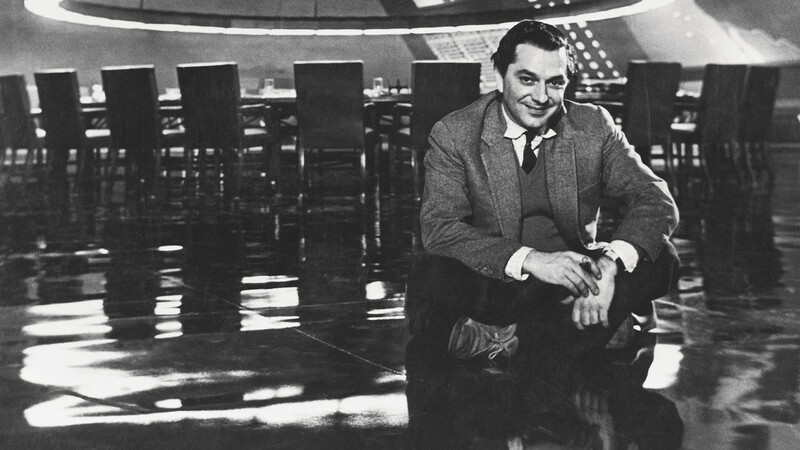 One of them is Sir Kenneth Adam, the iconic production designer who singlehandedly created the visual aesthetic for over 75 movies, including seven Bond films, two Kubrick masterpieces, The Ipcress File to Chitty Chitty Bang Bang. Situated just a few feet away from his OBE, a couple of honorary doctorships and two shiny Oscars, the tiny toy plane symbolises the start of one of Hollywood’s most amazing, yet comparatively underreported, journeys. Born Klaus Hugo Adam in Berlin in 1921, Ken had an early affinity with model making and design, spending countless hours sketching cars, planes, and buildings. After his Jewish family fled Nazi persecution in 1934, he went to school in Edinburgh and London, eventually studying architecture at UCL’s prestigious Bartlett School. 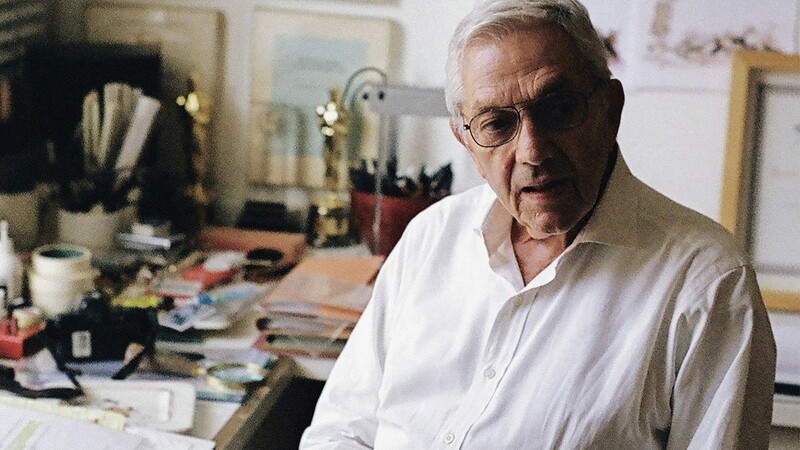 “As a teenager I was never quite sure whether I wanted to be a theatrical designer or a film designer,” he states with a noticeable German twang to his English accent. “I always knew I wanted to be one of them, particularly after watching The Cabinet of Dr Caligari. That film was so imaginative. It made me want to incoporate theatrics into actual film design.” However, before he got his first movie job, he signed up as a pilot in the RAF, earning the distinction of being the only German national to fight for the allied forces. His first 007 assignment came in 1962 with the film adaptation of Dr No. In the years leading up to it, he cut his teeth as a draughtsman at Riverside Studios, and later worked alongside Gone With the Wind production designer William Cameron Menzies, who encouraged Ken to use bold colours and stylised sets. After completing work on films such as Sodom and Gomorrah, Around the World in 80 Days, and The Trials of Oscar Wilde, he was offered the Bond gig. On set in Kingston, Jamaica he encountered a young boy who was also destined to shape the course of popular culture, although through music, not film. After his shark experience, Ken flew back to London and filled up three sound stages with a nuclear reactor, a tarantula room and Dr No’s sleekly modern apartment, offset with classical paintings. He then waited nervously for producers Cubby Broccoli and Terence Young to come back from Jamaica and pass judgement. They loved his futuristic vision and two years later asked him to recreate Fort Knox for Goldfinger. In typical grandiose style, he drew a monument to gold, reasoning that normal bank vaults were too boring for an audience to look at. In between Dr No and Goldfinger, Ken was hired by Stanley Kubrick to work on his cold war satire Dr Strangelove. It was the start of an intense working relationship that would win Ken an Oscar for Barry Lyndon, but also lead to a nervous breakdown. Even though the film was shot in black-and-white, the table was covered with green poker table felt, so the actors would feel like they were really bluffing for the future of humanity. The mind games carried on behind the camera. “I put a chess set on the War Room set because Kubrick said to me, ‘I’ve got to beat George C Scott every day so he’ll eat out of my hands’. But all of these were small potatoes compared to the volcano missile bunker he built for You Only Live Twice. “I could have built a model,” he ponders. “But then we couldn’t have flown a real helicopter into it or had 200 stuntmen abseil in from the roof. It took three months to build, stood 120ft tall and used 700 tonnes of steel. Although I did feel sorry for the men who had to hang up there in the middle of the night and make the fibreglass roof. 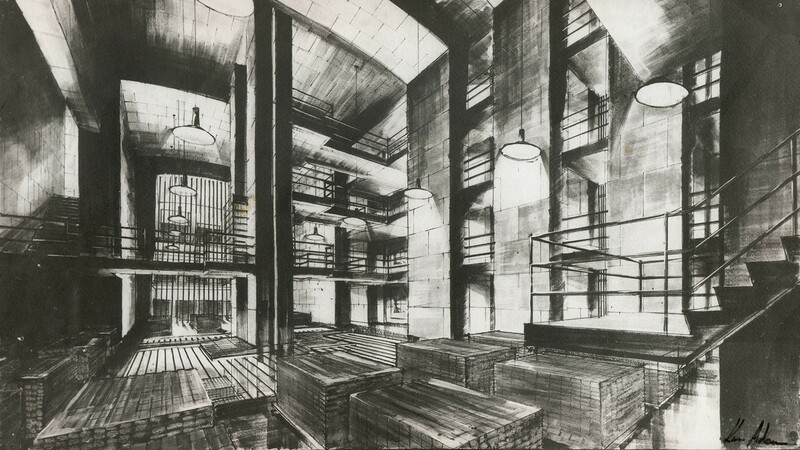 By the early 70s, Ken’s imagination had made him Hollywood’s most celebrated production designer, and in 1975 he got another call from Kubrick, who was preparing to come out of hiding after the fallout from A Clockwork Orange. He wanted to re-tell Barry Lyndon, Thackeray’s candle-lit ode to the Regency period. Ken reluctantly agreed. He had happily passed on the opportunity to work on 2001: A Space Odyssey. Physically exhausted, Ken had a nervous breakdown on set. Kubrick fired everyone for six weeks, and retreated to an Irish bolthole to rethink the film. “I can cope with normal pressure,” he says, with a gutsy laugh. “But it wasn’t normal pressure. I had to go into a clinic. Stanley was more worried than I was. I was beyond worrying really. He rang me every day but wasn’t able to talk to me because my psychiatrist wanted to cut this umbilical cord between us. Which he never managed to do, actually. After Barry Lyndon, Ken went on to work on two more huge Bonds – Moonraker, and The Spy Who Loved Me, for which he designed the world’s biggest movie set – a nuclear submarine-docking bay. It was such a national achievement, the set was opened by prime minister Harold Wilson (“I still have no idea why!” splutters Ken). In 1993, he designed a gothic mansion for Addams Family Values, and a year later won his second Oscar for The Madness of King George. The film’s aesthetic was based on his pre-Kubrick ideas for Barry Lyndon. Now 93 years old, Ken fills his days sketching new architectural ideas, swimming at the RAC club, chuffing back big cigars, and driving around town in the gleaming Silver Cloud Rolls-Royce he’s owned since 1969. In Berlin he picked up a lifetime achievement by the Raymond Loewy Foundation, plus the €50,000 cheque that came along with it. It may not be as prestigious as the OBE he collected from the Queen in 2001, but it seemed fitting that Sir Ken was finally getting formally recognised in the place where his extraordinary journey began.